Speaking of machine learning in the fashion industry, here is a model that is made for that: Stitch Fix, the fashion industry’s ‘new’ darling, is being watched closely by fashion industry execs worldwide. The six years old startup is picking out and shipping clothes to customers based on what it knows about their fashion preferences. It learns those preferences by having the customers fill out a lengthy questionaire. (part-time) stylists, with a little help by algorithms, select the clothes to send to the customers. In the last five years, Stitch Fix has grown to 4,000 employees. The company is operating 5 logistics centers in the US. Stitch Fix has around 3,000 stylists who are accompanied by 75 data scientists, led by the former Netflix technology chief Eric Colson. In three funding rounds, Stitch Fix raised $47 million, the last time was in June of 2014. According to a source at The Information (paywall), the company is profitable and doesn’t need to raise more money, privately or publicly. An IPO thus is planned but no time line has been set. 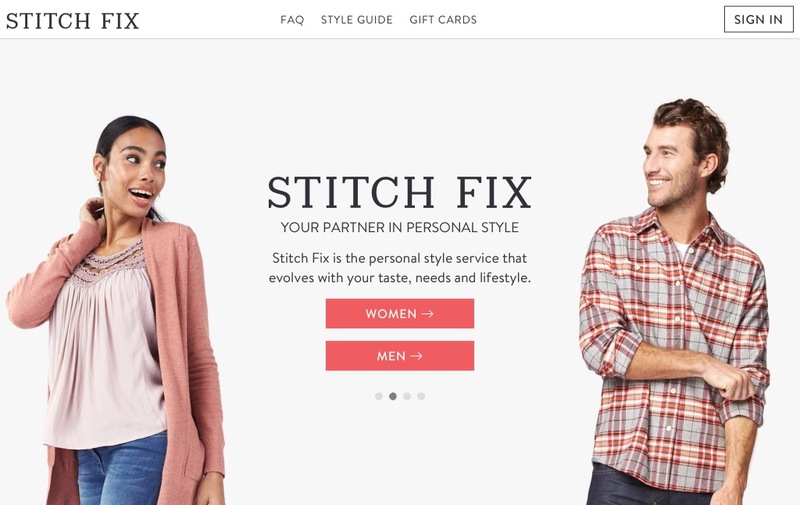 The former women only service launched a Stitch Fix for men recently. Now, Stitch Fix seems to want to attack in a big way this year. Stitch Fix is launching its first TV ad campaign next week, trying to reach more shoppers with higher fashion expectations in cities like Los Angeles and New York. It also has plans to partner with luxury clothing brands seen at high-end department stores. It may also create an “add-on marketplace” of small clothing items for customers to select themselves before stylists ship them surprise batches of clothes. Ms. Lake says these efforts are experiments the company can afford to make. According to an executive talking to The Information, Stitch Fix has a customer base in the “seven figures”. Revenues is expected to be in the the mid-hundreds of millions of dollars. To try and get it right, Stitch Fix asks customers to fill out an extensive questionnaire on their style preferences and other attributes, and has used image recognition technology to gauge their fashion sense from their Pinterest pages. Algorithms narrow down potential options, and stylists that work part-time pick which ones to ship out of the company’s five warehouses. It pays particular attention to gathering data about the right fit for each item of clothing. The company’s data science team is run by Eric Colson, who was recruited away from Netflix in 2012. This year he plans to expand the 80-person team by about a fifth. Stitch Fix is often going head to head with Airbnb, Facebook and Uber for talent, Mr. Colson says. Its algorithms make or break the business, which can appeal to recruits. The first time users try the 5-year-old service, they answer a few dozens questions about their size, style and the body parts they like to flaunt. Stitch Fix takes that data and plugs it into its algorithms, which come up with a list of clothing options. Then a human stylist reviews those choices, selects five items, and ships them. The customer has the option to buy the items or return them, free of charge. If the customer buys nothing, he or she pays a $20 styling fee per box. Stitch Fix’s software learns more about each customer every time he or she receives a shipment. The company asks what the customer liked or disliked about each item — using natural language processing to decode their written answers — and applies that data to the next shipment. “I’ve seen the things that come in my box start to adapt to more what my personal style is,” said Kelly Walker, a music teacher at Willow Glen High School in San Jose who orders a Stitch Fix box every month. StitchFix uses 50 different algorithms to conduct its day-to-day business. Aside from the formulas it uses to pick out clothes, it also has algorithms to assign each shopper to one of its 3,000 human stylists. Its tech systems figure out which Stitch Fix warehouse a client’s clothes should come from, determine which styles and how many of each item Stitch Fix should stock and even design some custom pieces. And Stitch Fix can use its data to spot fashion trends.